Toni Sailer created Olympic history at the 1956 Olympics when he became the first man to win gold medals in all three skiing disciplines of downhill, giant slalom and slalom and is considered by some as Alpine's greatest ever skier. Frenchman Jean-Claude Killy in 1968 was the only other skier to achieve a similar feat until Janica Kostelic became the first woman to win three golds at the 2002 Games in Salt Lake City. 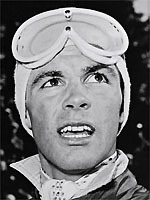 Sailer became an Alpine skiing legend on the slopes at Cortina d'Ampezzo when he was only 20, fully exploiting a revolutionary technique of swivelling and turning his skis to help him to that historic treble. The Austrian's path to glory began in 1952, when as a 17-year-old he won several races in France. In 1955 he found himself in the Austrian team, jostling for position with teammates and rivals Christian Pravda and Andreas Molterer. Gold medal number one for "Handsome Toni" came at the 1956 Games at Cortina when he annihilated the opposition in the giant slalom, crossing the finish line a full six seconds ahead of his compatriot Molterer in second place. A repeat demolition-job of the field occurred in the slalom, this time Sailer's margin of victory was a staggering four seconds over Chiharu Igaya of Japan. The treble now well in his sights, the Austrian brushed aside a problem with one of his skis to flash down the course and win the downhill race with another staggering time, three-and-a-half seconds clear of second placed Raymond Fellay of Switzerland. The triple Olympic champion then turned his attention to the 1958 world championships and made a spectacular start to the competition by winning both the downhill and giant slalom. The only slight flaw was a second place finish in the slalom behind compatriot Josi Rieder, but he returned to his winning ways by adding a third gold medal in the combined event. Following his retirement, he took up acting lessons and refined his singing voice, going on to appear in 22 films (at center) and recording over 20 songs. After living in Canada for seven years, Sailer accepted an invitation in 1972 from the Austrian federation to become the Austrian team coach, a role he fulfilled for four years before his election to the International Ski Federation. A former head of a Kitzbuhel ski school, Sailer also lived with his German wife, a former French and Spanish translator, in their chalet overlooking the beautiful Wilder Kaiser mountain range. He passed away in August 2009 at the age of 73 following a long illness.